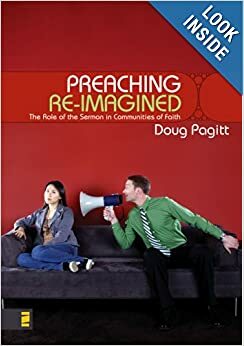 At our last Church in Progress meeting we talked about ‘Preaching Re-Imagined’ by Doug Pagitt. It was a strange experience reading Preaching Re-Imagined. It was like someone had taken my thoughts, articulated them and then printed them in this book. For some time now I have wondered what church would be like without a sermon slot. Preaching Re-Imagined is a book for anyone who has dared to imagine church in an alternative way. It is especially for those of us how are having a hard time voicing why we need to change and envisaging what transformation could come from doing things differently. The title suggests that this is a book about preaching in an innovative way. However, it is more about doing church in a new way. As this book explains, sermons are such a massive chuck of church culture. Adjusting the way we prepare and deliver our sermons has a huge knock on effect on many other aspects of church life. Essentially, Doug Pagitt the author declares that we need to reassess the way we communicate and relate to others. The problem is that preaching, as we know it, suffers from a relationship problem. This issue isn’t simply how we present the information but whose information it is. This issue isn’t simply how we tell the story but the relationship between the teller and the hearers. The issue isn’t simply the content we present but where we get that content from. Pagitt describes the majority of preaching today as speaching. This speaching is not having the transformative effect that preachers desire as it is mostly focused on the art of speech making. In fact, he states we are living in an age of prolific speaching, yet “if we look at how Christians continue to struggle with what it means to live in the way of Jesus, we soon realize that great preaching isn’t sufficient”. One of the real highlights of the book, for me, was reading about Pagitt’s wake up call. Being a sought after speaker at youth camps he had built up a quite a repertoire of rousing stories that worked well with this age range. He had developed a few techniques that enabled the crowd to connect with him even though they did not know one another. It got to the point he could even predict the moment in his presentation where there would be a “collective gasp”. After one such collective gasp Pagitt had a realisation. As I stood there, I realized that just because I can use a speech with a powerful story to lead a group where I want them to go, that doesn’t mean I should. [ ] I didn’t know these students, even though I acted and sounded like I knew exactly where they were coming from. I didn’t know what was happening in their homes, their schools, or their hearts. Pagitt’s book does not offer techniques for the preacher to manipulate a congregation and become a better speech maker. This is not a book about using the right illustrations to create a more effective sermon. Nor is it about getting creative by using the arts to appeal to different learning styles. This isn’t an effort to create hip churches with a novel way of telling the same story. I’m suggesting we need a new story – not just new content but new ideas about the way the story is lived. This story will require new practices so we can better live out the profound implications of the gospel. Instead of a linear process of Holy Spirit to Pastor to People he presents a compelling case for what he has called progressive dialogue style of preaching. The preacher and congregation are partners. Everyone provides content for the sermon and all are responsible for working out how it will impact their lives. For progressive dialogue to be transformative everyone involved needs to be open to be changed by the dialogue. Healthy relationship need to be formed and sustained to create a space in which people can safely express their opinions, share their stories and talk about their faith. At Solomon’s Porch where Pagitt is pastor, progressive dialogue means getting together midweek to discuss the scripture for that Sunday’s worship service. The pastor uses the insights, comments and discussion from that gathering to inform the service on Sunday. After reflecting on the discussion the pastor pulls together the thoughts of the group and presents them back to the congregation. The discussion does not stop there. The congregation are then invited to continue the conversation during the service on Sunday. It’s not about the preacher telling the congregation how to apply something to their lives. It is about the church working together to uncover how a deeper understanding of scripture will impact the way their live their lives. Pagitt is convinced this process is far superior to speaching. He believes that speaching limits our understanding of God to the way the preacher connects with God. “If we truly believe God is involved in the lives of the people of our communities, it seems obvious that we should avoid using a practice that tells them this involvement is determined by others”. Progressive dialogue appeals to me as currently I feel part of a consumer church culture. I either sit in the pews sucking up what the preacher is trying to communicate. Or I work all week and prepare a sermon which I attempt to communicate to others. Basically I’m providing a service or consuming a service. In either scenario there appears to be no commitment to having a transformative experience. If I am lucky I walk away from hearing a sermon with a helpful titbit that I can apply to my everyday life. If I am unlucky when I preach, I will get accused of not doing my job properly. Preachers are held up as experts and holders of the truth and it is a difficult standard to live up to. I have received much praise for my sermons over the years. However, if I’m honest no one has ever reported back that one of my sermons has impacted them in a transformative way. Mostly I am credited for my speech making skills or my ability to connect with the audience in innovative ways. I fit right into the stereotype of a speacher! After reading this book I am inspired to create a community that is not made up of consumers but full of active producers. I might just have to buy a few more books by Pagitt to get to grips on how to do it effectively! Doug Pagitt, Preaching Re-imagined: The Role of the Sermon in Communities of Faith (Grand Rapids, Mich: Zondervan, 2005), 21. Thompson, like many other writers, compares the role of the pastor to Paul. Thompson’s lists of requirements and standards for preachers seems endless and unattainable to me. Yet, Thompson calls the preacher to be authentic but I am unsure how a preacher can be honest about their inadequacies when the standard is set so high. James W. Thompson, Preaching Like Paul (Louisville, KY: Westminster John Knox Press, 2001), 146-7. Baker talks about how churches are full of people who are passively consuming the message each week. To break this cycle Baker suggests finding creative ways of turning them into co-producers. Progressive dialogue is one way to involve everyone in the process. Jonny Baker, “Preaching – Throwing a Hand Grenade in the Fruit Bowl. Something has to change.,” .